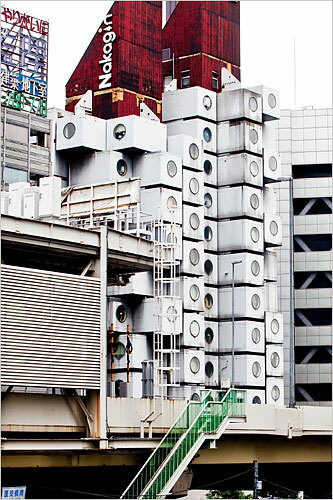 The New York Times has a piece (Future Vision Banished to the Past") about the likely destruction of Kisho Kurokawa’s Nakagin Capsule Tower, a "rare built example of Japanese Metabolism, a movement whose fantastic urban visions became emblems of the country’s postwar cultural resurgence." It's a piece that raises some interesting questions for futurists as well as architects and preservationists. the building’s demolition would be a bitter loss. The Capsule Tower is not only gorgeous architecture; like all great buildings, it is the crystallization of a far-reaching cultural ideal. Its existence also stands as a powerful reminder of paths not taken, of the possibility of worlds shaped by different sets of values. Founded by a loose-knit group of architects at the end of the 1950s, the Metabolist movement sought to create flexible urban models for a rapidly changing society. Floating cities. Cities inspired by oil platforms. Buildings that resembled strands of DNA. Such proposals reflected Japan’s transformation from a rural to a modern society. But they also reflected more universal trends, like social dislocation and the fragmentation of the traditional family, influencing generations of architects from London to Moscow. Like lots of twentieth-century architectural movements, the Metabolists were at least as influential for their ideas as their actual buildings. A lot of the more outlandish ideas from this period were never meant to be built-- drawings of walking cities were stimulating reflections on the nature of building in an impermanent world, but totally impractical-- but they made other, more prolific architects think differently about their work and the issues it raises. And they were arguably one of the most important advocates of a "lightweight infrastructure" approach to architecture, one that emphasized modularity, scalability, and standardization. Yesterday, Rod Falcon and I met with Dr. Atsushi Ito from the KDDI R&D Laboratories (KDDI is the #2 mobile carrier in Japan). He told us about a pilot that his lab ran designed to support weight loss among company employees. This is an important application since the Japanese government is requiring companies to work with overweight employees to lose weight (or be fined). The second version of the pilot will be launched later this year with a larger group of employees.